I haven’t done a video like this before – focusing on showing just how much you can get out of a small number of pens! In today’s video I used just one blending group of browns – E5s. E50, E51, E53, E55, E57, and E59. It’s amazing how many shades you can get just using one group of colors! See the grid below with all of them to see the variety. And watch the video below or click HERE to watch it in HD on YouTube. Here’s the whole group of cards – check out all the browns! I love the way you paired the animals together — too cute. You coloring and shading is awesome and make these critters come alive. I can’t wait to get my ray Dogs tomorrow. I already have the cats. 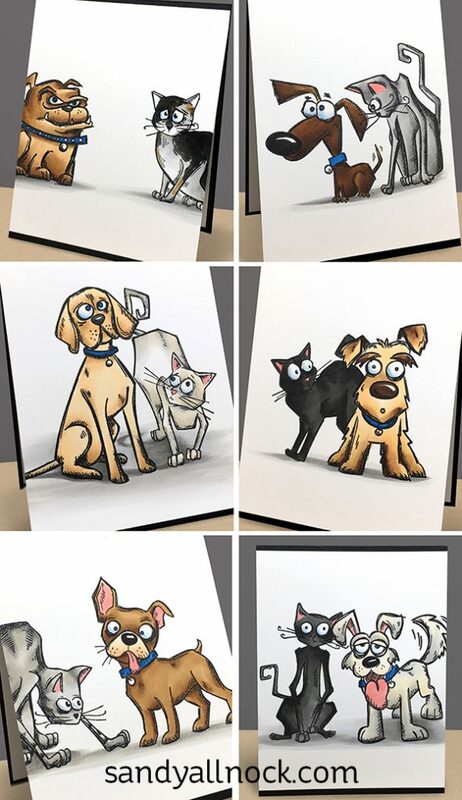 These are great since I do cards for my local animal shelter. These are fabulous! You’ve made these quirky animals come to life! These are awesome. Love the different looks/colours you achieved using the same colour family of Copics. It helps to know how much they can vary when using them. Now I won’t worry so much over the process as I know it will likely look a little different from image to image. It really is crazy how many different looks you can get with one color family.I think I’m gonna have to get the dogs.I have the cats & birds ,but I think I’m gonna have to break down and buy them.Well done Sandy. These are just the cutest cards. I have the dogs and cats on the way so I’ll watch again! Of course they won’t be as good as yours but I think that with those cute stamps it will be alright! Thanks for sharing your talent. I can’t wait to have time to play! Fabulous cards! The Crazy Dogs are due to arrive in my mailbox tomorrow, so your video is really well timed! Can’t wait to ink ’em up and take ’em out for a test drive! I agree with you – the cats are way serious – but I’m a dog person anyway! I’m amazed at the color variations you managed to pull out of those few markers – pure artistry! 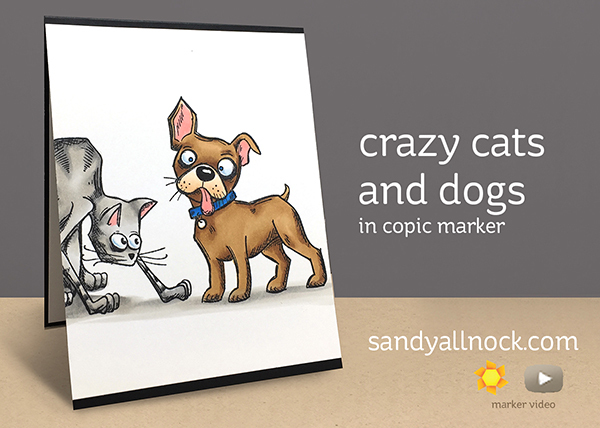 Hi Sandy,I bought the crazy dogs recently and so far have only attempted to colour one (not happy with it) I don’t have Cocopic markers but bought a few cheap pens.Not enough shades to colour realistically though.Will have to try with my coloured pencils next! LOVE your use of them with Crazy cats!! I’ve just received my crazy dogs. This is the perfect tutorial to help me color them. Of course now I have to get some more brown copics, but that’s just a minor thing 🙂 Those cards are wonderful. Love how you combined the dogs and cats! And of course your coloring is magic, as usual. Love watching your videos Sandy! These Crazy Cats and Dogs are so fun I put them on my wish list! Oh dear! I LOVE these!! ♥ Must. Have. All. The. Crazy. Things. I am in love with this line and I think you have just pushed my purchase to NOW 😀 Thank you for another awesome vid, too! The cats have been on my wish list with Ellen Hutson for a while. I have a feeling that resistance is futile at this point. Great compositions and your use of a limited color palette works so well. Thanks Sandy!